As a lover of cheetahs, I was very excited to learn that the "Cheetah Capital of the World" is Namibia. But, with less than 8,000 left in the world, the chances of seeing the endangered cheetah in the wild is very low! Still, I wanted to see these beautiful creatures in person and in the most ethical way possible. Before I traveled to Namibia, I researched and identified the Cheetah Conservation Fund (CCF) as meeting my high ethical standards around animal tourism. So I booked 2 tours with CCF. In this post, I share a full review of CCF. I include how I got there, what I learned about cheetahs, my experience seeing the cheetahs, and learning about CCF's efforts to save them. What is the Cheetah Conservation Fund? The Cheetah Conservation Fund is a non-profit founded in 1990 by Dr. Laurie Marker, a conservation biologist. CCF is an internationally recognized cheetah education and research center (cheetah.org). They promote education, research, conservation, and international programs to protect, rehabilitate, and release the endangered, wild cheetah. CCF runs many programs within Africa and internationally to to increase cheetahs' survival. Wildlife trafficking, loss of habitat and conflict with humans are among the principle threats to cheetahs. CCF addresses each of these in different ways. Is The Cheetah Conservation Fund Ethical? CCF upholds my most strict ethical standards for animal tourism. I researched several different cheetah tourism options in Namibia. For instance, I looked at the Cheetah Farm in Otjitotongwe and Na'an Ku Se north of Windhoek airport. None of them came close to the ethical standards of CCF. This is the same for the cheetah tourism options I looked up in South Africa, too! I especially appreciate these last two points about CCF's educational methods. Education, to me, needs to be multi-faceted. It should not only include educating tourists who will bring in donations and spread the word back to their richer, Western countries. Education also needs to include local educational and research efforts through community outreach, programming, partnerships, and policy recommendations. The cheetah conservation fund hits all the marks in this area. In speaking to their guides, two American ecologists, I learned the extent of the organization's collective ethics around animal tourism. For example, one guide expressed that it's considered a sad day when an orphaned cheetah cub arrived at their facility. It is sad because their chances of surviving in the wild are slim to zero. Meanwhile, other places promote and even breed cheetah cubs to increase tourism. Why Do Cheetahs End Up At CCF? The cheetahs end up at CCF for numerous reasons: Farmers shoot them, people keep them as pets, farmers caught them in traps, they are orphaned when their mothers are shot, or (in rarer circumstances) they are abandoned by their mothers. Cubs who are too young to have learned to hunt properly or cheetahs that are too humanized to survive in the wild become a part of the facility for education and research. It's responsible to take in and take care of cheetahs that would otherwise die as a result of human conflict and encroachment on their habitats. Humans are responsible. So CCF takes up the responsibility to fix the problem through rehabilitation and education. Finding a release location for cheetahs that are wild enough is a challenge for CCF. Farmers' properties make up the majority of the land in Namibia. The likelihood that a cheetah will once again wander onto a farmer’s property and be shot or injured again is very high. Why Do Farmers Kill Cheetahs? Farms in Namibia (and all over Africa) have encroached on cheetahs' natural habitat. Farms also provide easy prey and protection for cheetahs. Lions and hyenas often steal cheetah’s kills because cheetahs cannot defend themselves against them. As a result, cheetahs are often trying to keep ahead of other predators. This has further pushed cheetahs onto farmland. Livestock provides lots of opportunity to the cheetahs so their chances of actually eating a kill is higher. But farmers need to protect their livestock. Namibian law states that whatever is on a farmer’s property is the farmer’s property. And so farmers have a right to shoot the cheetahs or set up traps to stop them. When cheetah mothers die the cubs become orphans. Farmers will then call CCF to pick them up. But sometimes they will take in the cubs as pets until they realize they should not or cannot properly care for the cheetahs. In the past, farmers in Namibia reported an average of 19 cheetah removals a year. But this number is dwindling due to CCF's efforts. What Is CCF Doing to Stop Farmers Killing Cheetahs? As a research facility, CCF is leading a successful program to breed and sell Anatolian guard dogs to local farmers. All sales go back into cheetah conservation at CCF. And it's a win-win for the farmers and the cheetahs since the cheetahs see the dogs and move off the farms. The farmers keep their livestock and the cheetahs keep their lives. In addition to the dog breeding research program, CCF also conducts general outreach and education with local farmers. The CCF is a little over 200 miles (337km) North of Windhoek airport. You need a car to visit most places in Namibia. Either arrange for a guide or local to take you to where you want to go or plan to drive yourself. Roads in Namibia can be very rough and dangerous, but the road to Otjiwarongo is not bad at all. There's a dirt road for the 40 minute drive from Otjiwarongo to the CCF location. But it isn’t as bad as some other roads I saw while visiting Namibia. Through couchsurfing.com, I met a local Namibian, Tashia, who arranged our ride to/from Windhoek and CCF. One friend picked me up from the airport and another drove us, with her son Shaya, to Otjiwarongo. A 3rd friend took us to CCF in the morning. We had to leave very early to make an 8AM Cheetah Run Tour. The view of the Waterberg Plateau at sunrise was gorgeous! After the tours at CCF, we hitched a ride with a German couple back to Otjiwarongo while we waited for Tashia's 4th friend to drive us back down to Windhoek. It was a whirlwind of rides that added up to tips and fuel costs of around 750 NAD (my half of the cost). We could have stayed at the CCF grounds for over 2800 NAD per night. To save a few bucks, we decided to stay at the Hadassa Guest House in nearby Otjiwarongo. This was a nice 2-bedroom in a guesthouse with breakfast included for only 900 NAD per night. They prepared bagged breakfast for us since we would leave too early to make it to breakfast in the morning. We returned to Hadassa in the afternoon for a swim until our ride back to Windhoek arrived. The owners were h us dipping in the pool and lounging there after we had checked out. The only complaint about Hadassa is they do not have a restaurant. And they are a little far outside of town to walk to find food. We felt a little isolated without a car. Luckily, Out of Africa (a hotel) was across the street and they have a restaurant. I would suggest you compare prices between these two or other locations before you book. They were both around the same price. But Out of Africa gets you the convenient restaurant attached to their hotel. Out of Africa also had really awesome decor! It generally felt much larger and luxurious than Hadassa. Which Cheetah Tours Should You Go On? Definitely do the Cheetah Run tour at the Cheetah Conservation Fund. I felt so satisfied by it that I almost didn’t need to do the Cheetah Drive tour after with Tashia and her son. But I was happy to spend another 480 NAD to the cheetahs! The cheetah run tour is at 8AM most days. You'll get to see the cheetahs exercise and an ecologist will provide lots of information about cheetah behavior. I had a great experience on this tour because the cheetahs ran freely and were happy to hang around nearby after they ran. But you should have realistic expectations for the Cheetah Run Tour. The cheetahs won't run or sit near tourists if they don't feel like it—they are wild animals and they are cats, after all. The cheetah run is limited to adults and children over 12 years old. The reason for the age restriction comes down to size. You enter the enclosure where the cheetahs are free to approach you. It's important you are adult-size and not prey-size or the cheetahs may think you’re a snack! I loved the Cheetah Run because I got to see them do what they are famous for: run at top speeds. Cheetahs reach 60-70mph when they are on the chase. They were so fast, I had trouble timing my photos right to capture them. Here one photo fail and then another decent one! Cheetahs will get lazy and fat in captivity which is unhealthy for them. So CCF tries to simulate regular hunts and chases for them so they can get the most natural exercise they can. CCF cannot set up an actual hunt, so instead they set up a pulley system in which the cats chase a plain piece of fabric that moves around their large enclosure. It’s completely voluntary and basically like a giant cat toy! When the cats catch the fabric, they are rewarded with a piece of bloody meat. One of the ecologists uses a long wooden spoon to feed the cheetah and it also offers a bit of protection in case the cheetah gets feisty. They let two cheetahs out at a time into the large pulley system enclosure. Meanwhile, us tourists were behind a small pen that put us right in front of the pulley. It was so exciting watching them run around and around the enclosure. It’s like cat videos on youtube but with huge, super fast cats! The Cheetah Drive tour has a safari feel to it. You ride on the back of a truck and get right up close to the cheetahs. The difference is that the guides know exactly where to find the cheetahs. They time the drive tour during a feeding with a coalition of male cheetahs. The safari truck entered the enclosure and pulled up as they are munching on a big boney hunk of game meat. It’s a great way to see the cheetahs up close if you can’t make the early morning Cheetah Run. The Cheetah Feeding is actually free to see even if you don’t pay for a tour. They feed the cheetahs at the same time and same way every day – at about 12pm. So you can watch them run to their giant bowls to chow down for lunch. The cheetah feeding was interesting to watch because of their routine. They are creatures of habit who prefer to have their bowl placed in the same location every day. For example, one cheetah always takes her meat out of the bowl and eats it up off the ground in the same spot every day. This is her consistent behavior unless she is in a different enclosure. Also, when CCF introduces a new cheetah to the facility, it messes with all the cheetahs routines. When we were there, a new cheetah and his 2 counterparts were still figuring out how to coexist. One cheetah stole his meat at first. The new cheetah had to steal it back! Included in the cheetah tours is a tour of the facility. I wasn’t super clear on what this was - we never got a formal guided tour around the facility. But we did explore the museum and walked around the grounds in our own time. There's lots of information to take in. But its clear the facility has gone up and down over the years in its support. The museum felt a bit dated but all the information was excellent! 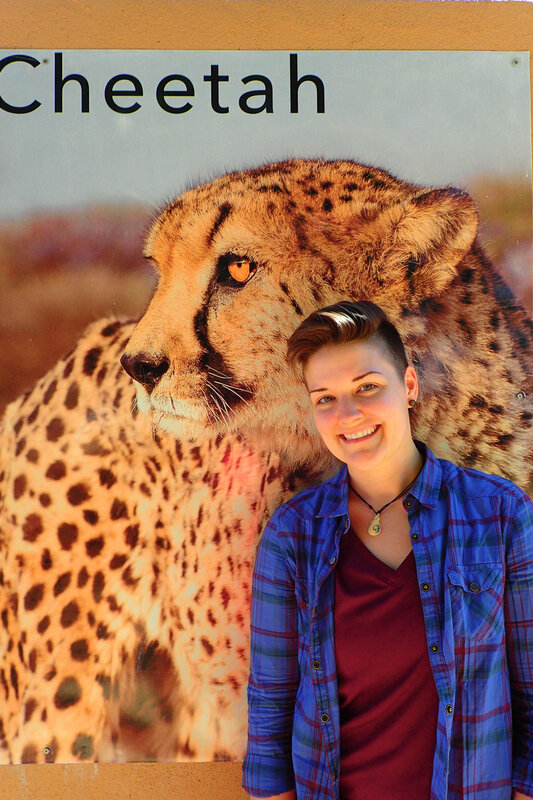 I loved visiting the Cheetah Conservation Fund. They hit all the marks for me. It was a great tour experience while maintaining the ethical standards I wish to keep as a tourist. This was a feel good experience all around. It was amazing to see these beautiful creatures in person, living a free and healthy life at the facility. It's sad the cheetahs I saw there will never be able to survive in the wild. But I felt good knowing they were well taken care and that their presence contributes to awareness, education, and needed research to sustain their species.